Features two height adjustments, from 5 foot 6 inches to 6 feet tall. Polyethylene base fills with sand or water and is rounded for easy roll relocation. Approximately 270 lbs. when filled. One year limited warranty. Additional shipping charges apply to this item due to its size and/or weight. 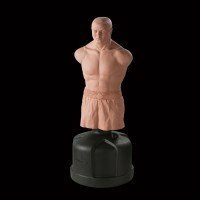 MANIKIN 40” X 15 1/2” X 10 1/2” BASE 24” DIA Additional shipping charges apply to this item due to its size and/or weight.